This New Moon could feel big simply because Mercury is finally going direct. 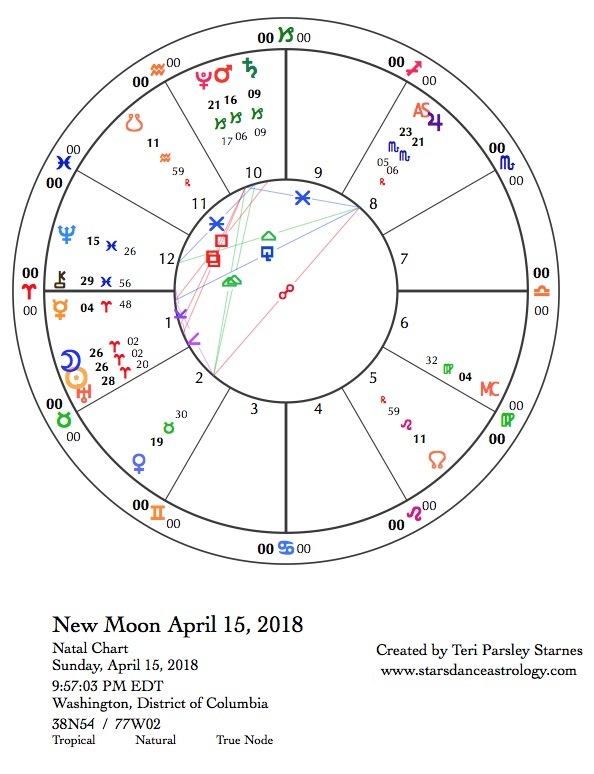 I don’t usually equate Mercury’s retrograde periods as being the cause of major upheavals, but this recent one, which ended the day before the Aries New Moon, might be an exception. This three-week period felt harder to me. Things moved very slowly. My brain felt foggy. Details kept getting lost. I overbooked my time, which led to feeling overwhelmed. Did you notice that? The good news is that things are due to shift. 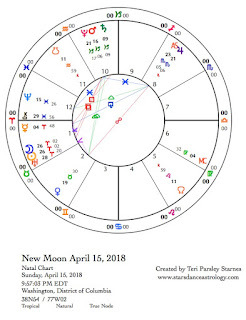 This Aries New Moon, begun on April 15, is a good opportunity to set down a new pattern and have a new relationship to time and details. Things will also speed up as Mercury begins to go forward. We will hardly notice that Mercury was ever retrograde at all (that’s human memory for you) after Mercury in Aries makes the last of three squares to Saturn in Capricorn on April 25. That’s when we are done learning what we needed to learn from this particular retrograde period. We’ve been incubating something in this slow and backwards time. Now it hatches. The lunar cycle that begins on April 15 is about a new start. What gets you moving forward? Where do you want to go? Perhaps the better question for Aries is not about where you want to go, but how do you want to get there? Aries doesn’t give a lot of forethought to where it is going. It’s hard to choose a destination when you are not sure just who you are. Aries is also about identity. Aries says our beginnings come from a sense of self. I had the pleasure of spending the past weekend at the Trans Voices Festival in Minneapolis. A glorious spectrum of gender identities were present at this conference. I heard so many moving stories about the struggles and joys of searching for and claiming identity. Each person’s story inspired me to take a look at my identity too. Identity is not static. We get to keep asking. We get to keep going deeper into the question of who decides our identities. We get to ask ourselves, who we are now? This question of identity is ongoing. For this lunar cycle, perhaps you want to notice how identity flows from one celestial influence to another. Each influence changing the pattern just a little. Each change to the pattern giving a new flavor to who we are. There is a great fear of fluid identity in the dominant culture. Why is that? That’s a pattern that can change as well. Perhaps fluidity shows us how to be responsive and adaptable to the moment. Maybe we need this quality as we go forward into our beginnings. In the chart for the New Moon, Uranus in Aries is conjoined the Sun and Moon. Our senses are attuned to change. A big change occurs just a few days later on April 18, when Uranus enters Taurus. Uranus spends seven years in a sign. It moves into Taurus now for a bit and then back into Aries for a few months before finally entering Taurus in March 2019. This transition from Aries to Taurus signals a brand new way to think about change and revolution. It brings our attention to the Earth big time. The Aries to Taurus shift represents the impact of identity on our values. This theme shows up this month when the Sun moves into Taurus a few days after this New Moon. We aren’t done with major Aries influence for the next few years. Chiron, the Wounded Healer, moves into Aries on April 17. Chiron dips back into Pisces from September 2018 to February 2019. Then, Chiron stays in Aries till 2026. We are in for a long period of sensing the wounds around identity and seeking deeper sensitivity and wisdom. What is the impact of identity on our actions? Who do we belong to? Who do we owe amends to? This is one theme. Chiron addresses where we need healing. Other themes for this time in Aries include war, violence, toxic individualism, and isolation. While planets are stationary their influences are stronger. Saturn and Pluto are both stationing retrograde during the first half of this lunar cycle. These planets raise the stakes. Although Mercury stationing direct will help us feel a stronger sense of forward momentum. These two planets ask us to consider what is most important to us. We may need to go slowly as we figure this out. Mercury in Aries and Mars in Capricorn contacts to Saturn and Pluto will provoke stronger reactions. These occur on April 25 when Mercury squares Saturn, on April 26 when Mars conjoins Pluto, on May 7 when Mercury squares Pluto, and on May 12 when Mercury squares Mars. Aries influence encourages stepping into the unknown. There is a certain amount of risk. There is a certain amount of naivety involved in our choices and actions right now. Notice where you feel comfortable. Notice where you don’t. What edges of identity are being pushed? How can we better see the fluid nature of ourselves? How can we embrace the Mystery of where our identities will take us next? With the strong Chiron influence in this exploration, we are encouraged to look at harm, the harm we may have done, the harm done to us. Can we fold into this dance of identity both compassion and accountability?